← Mýrdalsjökull, Reynisdrangar and Dyrhólaey…oh my! Strolling along the Danube promenade our first day in Budapest, we came upon a puzzling display of cast-iron metal shoes, clearly of the 1940’s vintage. They were fixed to the cement of the walkway and designed to look like the owners had just thoughtlessly left them there, cast-off and in disarray. There were men’s and women’s and small shoes for children. I thought it was an art installation of some sort. There are many of those in Europe, usually of a whimsical nature, designed to bring a smile. We played along with that thread and I had my traveling companions stick their feet in amongst the lost shoes while I took a few photos. I was seeing one thing but not its meaning. They are a memorial and as such are designed to bring tears not a smile to the face. 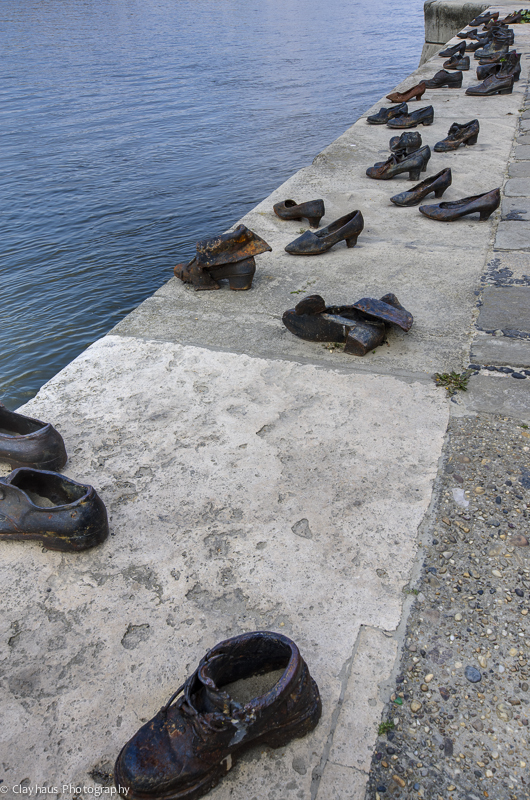 The sixty pairs of shoes represent the uncounted Jews (and their supporters) that were shot and pushed into the river during the Arrow Cross (Hungarian Fascists) terror of 1944-45. I see the thing and now I cannot see it but for it’s meaning. What compels people to do such things? What were the victim’s last thoughts, standing naked and shivering, awaiting that bright flash. Incomprehensible. And though I am saddened by what it represents, we must also never forget, and for that, I am also thankful.